These are the reasons presented by Ichud to attend the Asifa. 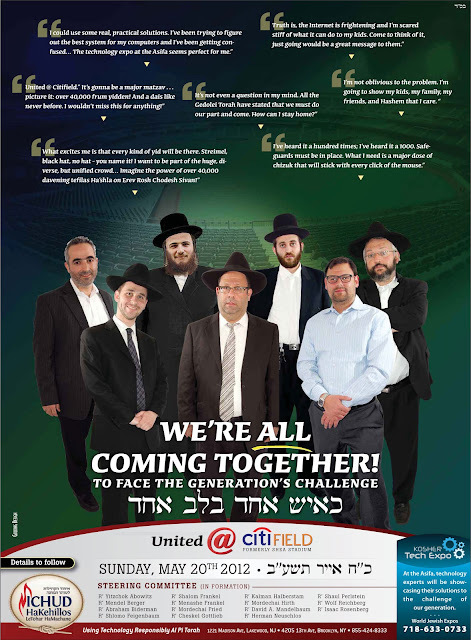 Feel free to comment on YOUR take of this "Big Event"
"All the gedolei hatorah have stated that we must do our part and come. How can I stay at home?" Personally, I have no connection to the Gedolim or even most leaders on a lower level. Them telling me I have to do something, isn't going to do it. I'm not saying they're bad people, i just cannot relate to them in any way. Love the classification of Jews as well, "Streimel, black hat, no hat..." What type of human are you? I'm being serious here - who is speaking? Who put together the agenda? Will there be a range of perspectives presented to enable an informed discussion and decision? Will advice be presented as fact or will we empower the community? While I applaud the idea that the community is waking up to the laptops in their teenage son's rooms and hopefully the ratings on their video games, the nature of the community dynamic is that edicts without education and understanding are going to one again fall flat. I haven't seen an agenda, so other than the pre-event hype and controversy, I still don't know what this event will actually be. just saying Rabbi Mordechai Finkelman, my mashgiach ruchani told us he was part of planning of event, and he said tht @ meeting R solomon spoke about how they r not righting the internet, but rather the yetzer harah. not sure y the ad has the words "the internet" on the side, as if it seems they ARE battling the internet. The real humans behind this project arent in charge. As Rabbi Maryles wrote about in his "moral mafia" post, about ur episode with the fjj. Did he mention anything about going to the Asifa or not? The cliched quotes on top are funny as h*ll if you read them with a chassidish accent. I don't see how anyone with a working brain will waste their time on this farce. Rabbi look at this IMAGE. Can you translate and put in context. Please.